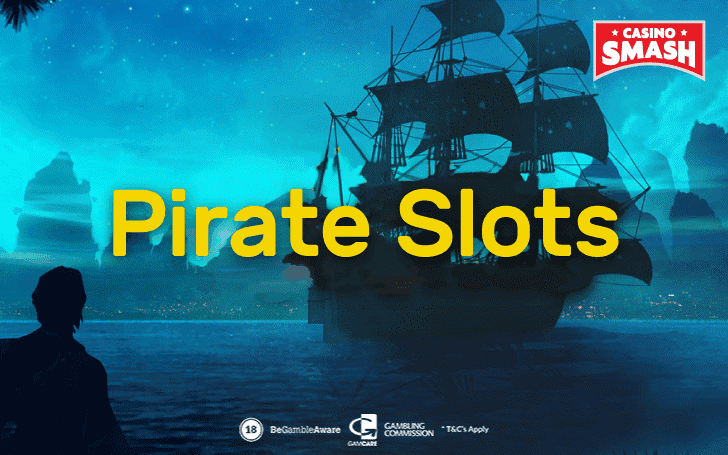 Say Ahoy to the list of the best pirate-themed Slots this year! Did you ever wonder how many Pirate stories and adventures float around? Even if you look at online Casino games alone, you can test your knowledge about all things Pirates. Pirates and Slot players have something in common, after all. They both seek for a treasure. Whether one is buried underground on some deserted island or comes in a form of a Slot machine payout. Join the pirates in the search for treasure and reap the winnings of the best Pirate Slots games this year! Exploding Pirates Spinomenal 96.8 percent Play now! Clash of Pirates Evoplay 95.1 percent Play now! Barbary Coast Betsoft 93.2 percent Play now! Booty Time Quickfire 96.48 percent Play now! Wild Seas ELK Studios 96.3 percent Play now! Loose Cannon Quickfire 96.13 percent Play now! Gold Ahoy Quickfire 95.38 percent Play now! Queen of the Seas GameArt N/A Play now! 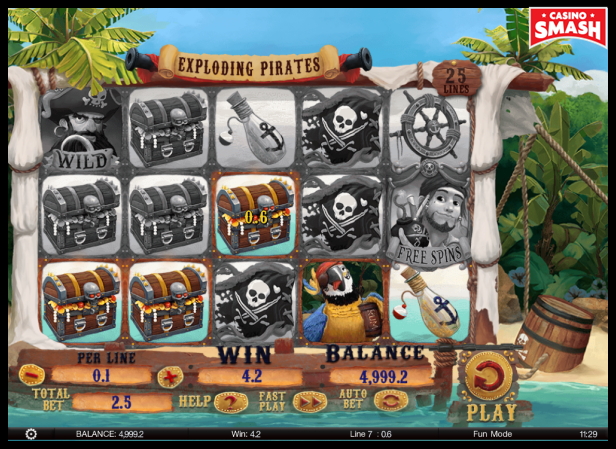 Exploding Pirates is a five-reel three-row Pirate Slot game by Spinomenal. It has 25 paylines that pay both ways. 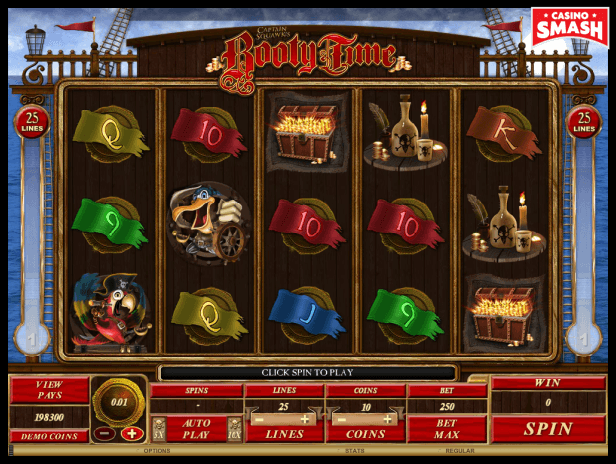 The Slot game features the Pirates of Carribean-kind of music, sunny island in the background of the reels, and spins Pirates and symbols related to them. 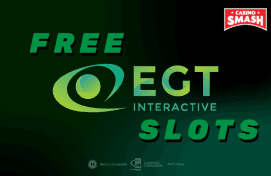 Free Spins bonus here is an exceptional treat. First, the win that landed free spins bonus is tripled. Plus, you get 10 free spins. During the round, you need to land three Rope symbols to “burn the rope”. First time it burns, you explode the parrot and it turns into a wild for the remaining spins. When you land three more Rope symbols, you explode a pirate and get one more free spin. Three Rope symbols later, you explode the last pirate. You win extra three spins. All the “exploding” pirates become wilds from the moment they burst to the end of the round. Picture a horror movie about the pirates. If your imagination is vivid enough, you’ll see a similar story in the Clash of Pirates Slot by Evoplay. 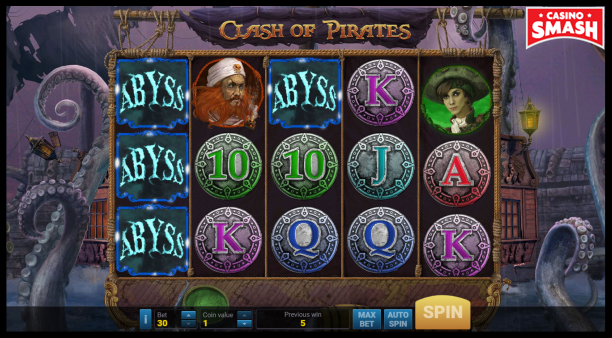 This five-reel Slot features pirates (or their ghosts) and an evil sea monster Abyss. When you land Abyss symbols on the reels, its limbs smash the Abyss icons to reveal random different symbols instead. These symbols are of the same kind, so you get bigger chance to trigger one of the 30 paylines. The Clash of Pirates also has a scatter symbol that is active during the main game. 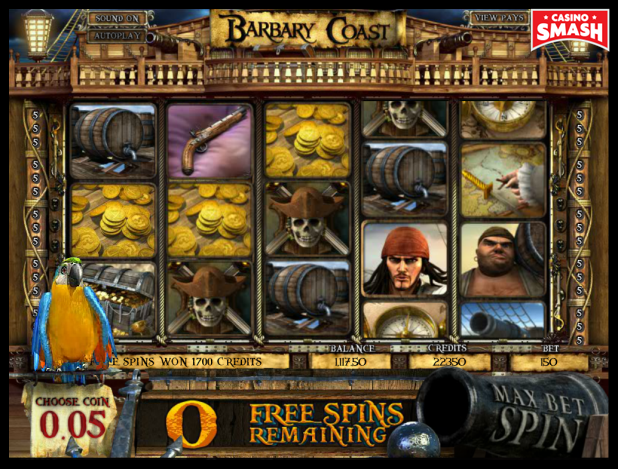 If you like Casino games that look and sound like video games, Barbary Coast will not disappoint. 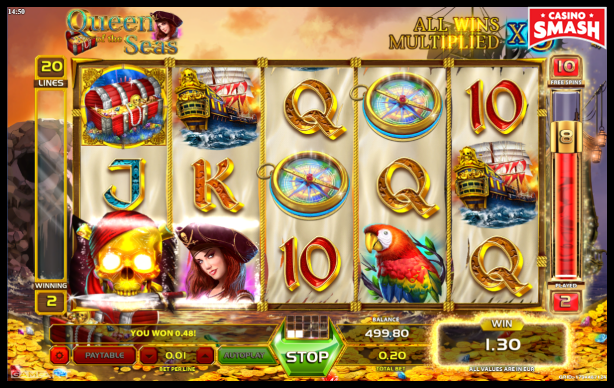 This five-reel 30-payline Slot incorporates video clips and the whole background story about the pirates looking for the treasure. The graphics are impressive and the music will take you to the last Pirate movie you've watched. But the bonus features are the real deal. Three Parrot symbols activate the Free Spins feature. It also includes an instant bonus prize! Cannon symbol on the middle reel triggers Explosive Wild Reel feature that lingers for one more spin. Three or more Pirate Ben Sawyer symbols trigger The Dashing Sawyer Click Me feature. It’s a pick-an-object game awarding instant cash prizes. If you land three or more of Captain Blackbeard symbols instead, you’re getting involved in a swordfight. Choose your actions in order and win the fight to rescue the beautiful maiden and get an instant cash prize. If you land three or more Worker symbols, you’re in for a drink-off with a worker. Guess if the coin flip will result in head or tails and drink every time you guess wrong. Prove you can outdrink the worker to win even more cash! Captain Squawks Booty Time is a slightly different pirate-themed Slot because it focuses on the Pirates’ pets - the parrots. They drink, they party, and they look for the treasure in this five-reel 25-payline Slot by Quickfire (Microgaming). The Slot logo works as a wild. It substitutes other symbols in the game. And once it does so in a winning combination, the win is doubled. The Treasure Chest is the scatter. You need to land three of them on the reels one, three, and five, to activate the Booty Bonus. It starts with you choosing one of the scatters and it revealing the number of picks you’ll be able to make in the next step. The picks of what, you may ask? That would be the Treasure Chests. You start with three free spins and multiplier of 2x. Each opened chest adds more free spins and increases the multiplier. Wild Seas is one of the newest Pirate-themed Slots on this list. Thus, you can expect a flawless mobile game, high-quality animations and sounds, and many unique features. Wild Seas has five reels, four rows, and 178 paylines. You can see the wager size both in credits (coins) and real money. The bets start at €0.20 and go all the way up €100 per spin. If you bet max, you can win up to €178,000. Land two wilds (Wild Seas Flag symbols) to trigger the Break the Convoy bonus game. it's a Free Spins feature that triggers four ships to start moving from the fifth reel towards the first. Every Pirate ship lands on the right side from the ships, it hits one of the sailing ships with fire. After at least one ship has been hit for three times, it sinks, and you move on to the next level where you need to hit the treasure chests instead. Pirates, treasure maps and chests, guns and cannons, lots of gold and rum. 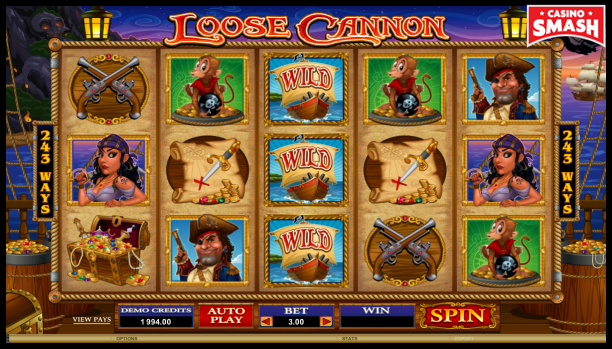 Loose Cannon gathers all Pirate-related stereotypes to this five-reel 243-payline Slot by Quickfire. Apart from the pirate things, it also has a fair share of bonus features. Wild Cannon Bonus is active when you land a wild symbol (a Ship) on the middle reel. The symbol fires left or right and the symbols that have been hit turn to wilds themselves. Free Spins feature is triggered when you land scatter symbols on the reels one, three, and five. This way, you get 15 free spins. 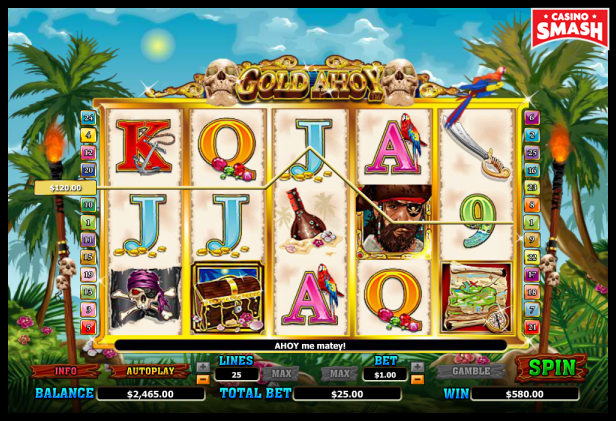 Gold Ahoy is a five-reel 25-payline Pirate Slot that goes straight to the point of digging treasure. Land three Map symbols to reveal the map of the island. According to the map, choose a spot to dig and it will trigger free spins with a multiplier. The maximum amount to trigger is 30 free spins. They can have up to 4x multiplier. If you land three Chest symbols instead, you activate the Chest Bonus. It’s a pick-an-object game where you open the treasure chests to reveal your winnings. Triggering the bonus game during the Free Spins feature is quite a jackpot: the multiplier applies to the Chest Bonus wins, too. 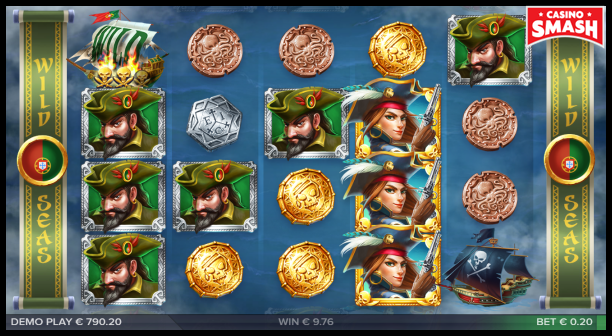 While the infamous pirates are usually men, the Queen of the Seas Slot is here to prove that women make badass pirates, too. The wilds of this Slot not only substitute other symbols but also double the wins when doing so. The Queen of the Seas also has a Gamble feature. You can gamble with your wins by guessing whether the next playing card in the deck will have a red or a black suit. Every right guess doubles your winnings.